All good things come to an end. Well I guess that’s true as SwimTrek finishes today. Would it be the sensational last day we hope for? Everyone was very chatty on the walk to the port. Last day brings an extra energy even though some have picked up coughs and colds! Into the water taxi and off to our two waiting boats for the day. Luck put me on Nicko’s boat. Even though it has less shade, it is more business class style of travel (not that the other boat was bad – perhaps not quite the same level of service!) I had been told by Joe and Lexie that Nicko provided rolled towels, boxed tea selections, iced lemon water, a set table for lunch and a pristine ship-shape cabin. I did not quite believe it until it happened. We motored for about 45 mins to a new island, Isola Santa Fe. Into the water and once again gorgeous swimming weather. I needn’t have worried about needing a wet suit. It would have been perfect in just swimmers, or cozzie or bathers or togs. Whatever you call them! I used my wet shirt / rash vest against the rather brutal sun. Along we went stopping more frequently than usual to look at fish, turtles and assorted sea life just to make the day last longer. In the end we got to a small island which we could circle and circle until they dragged us out of the water. 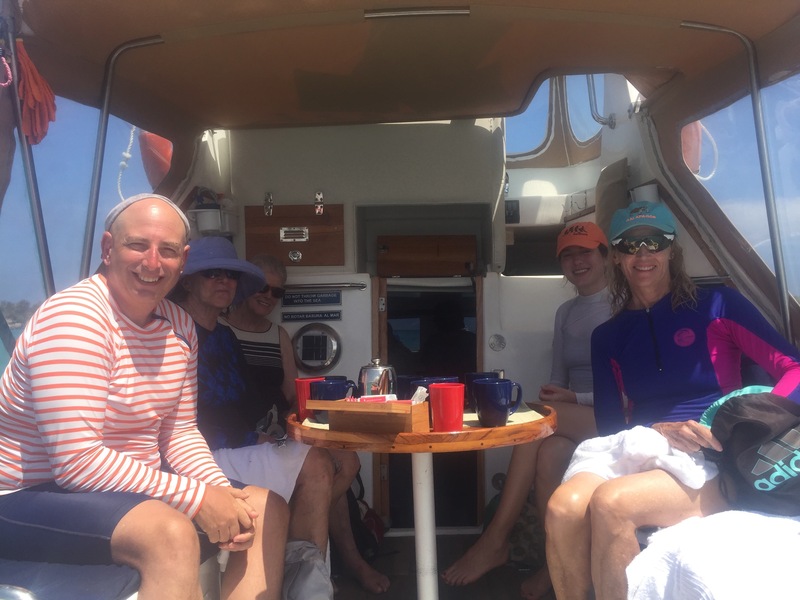 Morning tea and then we motored along to a protected bay where we did some more snorkelling and played with the super friendly sea lions. I’m not exaggerating when I say they come up to you and roll, wanting you to imitate them. They blow bubbles at you. They practically nudge you to get you going! So much fun. Lunch on Nicko’s boat was great. Places were set up when we climbed back on board. I’m becoming an expert at getting back on the boat! Being stronger helps. Our boat had grilled tuna on his little bbq with a lovely side of rice and veggies. Followed by chocolate and tea. The other boat had mixed cerviche and fruit. We are definitely being spoilt. Our “girl guides” Marlys and Kelly would normally have to have shopped and pre prepared our lunch as is done on other swim treks! They are enjoying the change as well. Nico in the water telling us about the sea life. To finish the trek we found another beautiful section of coastline and swam, all groups together, for about 2 km – we didn’t want it to finish. And it didn’t! We pulled into no-name beach and were allowed ashore. It had sand and before long the group were doing yoga – started off by Canadian Mr Fresh, Barry, then continued with a few different poses by Roly, before the finale of Lexi and Roly doing handstands. Lots of laughs and clapping. Back on the boat for our trip back to Porto. Nico chatted to us about his life in Galapagos, his political views, and Lynn our American journalist took a few notes. She is going to be writing a commissioned article about this first Galapagos Swim Trek. It will appear in a Swimmers World magazine in America. Can’t wait to read it. Final night on Swim Trek is always a a buoyant fun night, tinged with sadness. It’s over. Something we all looked forward to for months is finished. Lots of laughs from a group of not just fellow swimmers but friends. Lots of exchanging of emails, instigated by Lynn, our funny determined journalist from America. She and her sister Lynn, who had only had a knee replacement a few months ago, were both so much fun and wouldn’t give in. Wonderful gals. We felt for Andrew who had cut his foot and it had become infected. So no final swim for him. No party night. Good luck Andrew. Lexi is going to continue the party on San Cristobel. She is the ‘whip smart ‘ youngest member of our group and we’re starting to think she should move from law to stand up comedy. I will feature her description of her first day without us all! Watch this blog. Bill and Barry ( Mr Fresh ) are in Cusco when we are, so more party time with them. Yah! Patricia folded and missed party night with ‘the shared cold’. And she was one of our strongest swimmers. Rebecca our funny, never say die, pinky swimmer and yoga Roly and wife Yvette ( she didn’t swim but was part of the group each night). 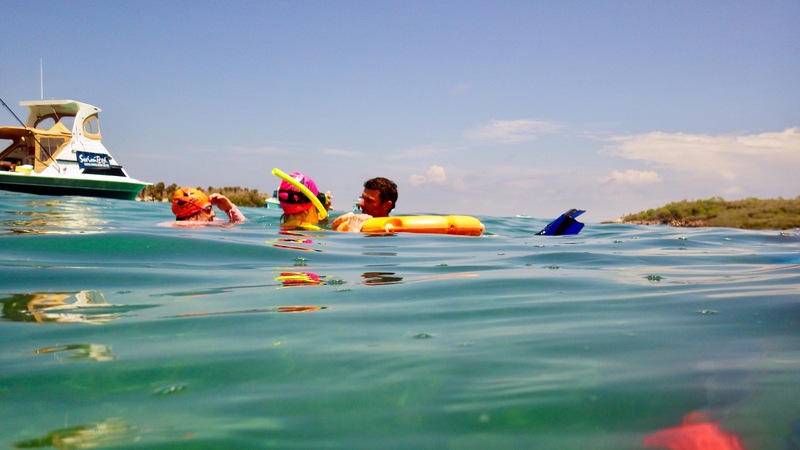 Joe , how can I safely swim without you looking out for sharks? Miss you all. We all plan to stay in touch and I’m sure over the months and years we will catch up again. So farewell swimmers, my new friends. It was fun. 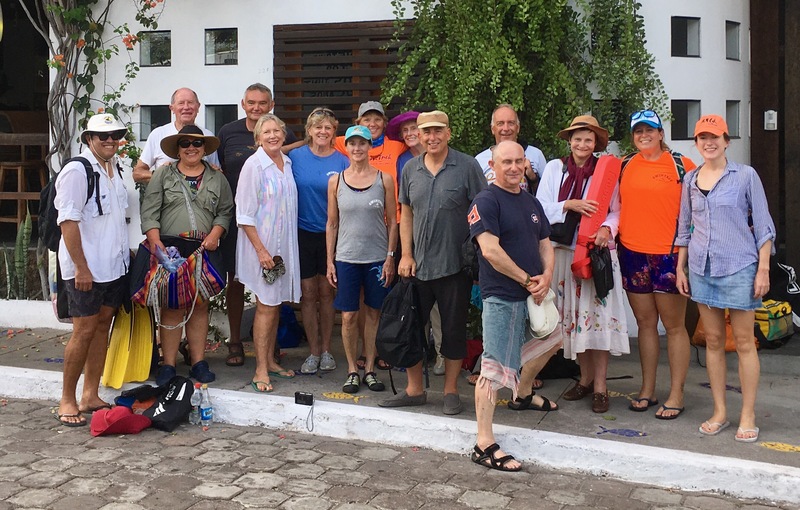 Thanks to our great ” girl guides” Marlys and Kelly and to Simon , the head of Swim Trek who joined the trip ( with his dad Bill) as it was a first. Now to start the next part of the journey. Cusco here we come. Sounds like a fantastic swimming holiday. Happy for you. Wonderful write-up and pictures, Fran. Glad you had another great swim trek and got to see the unique wildlife. Machu Picchu should be just as enjoyable, just in a different way. Coca tea and corn beer. Fran, just realised Kelly was my guide in Montenegro!!!! 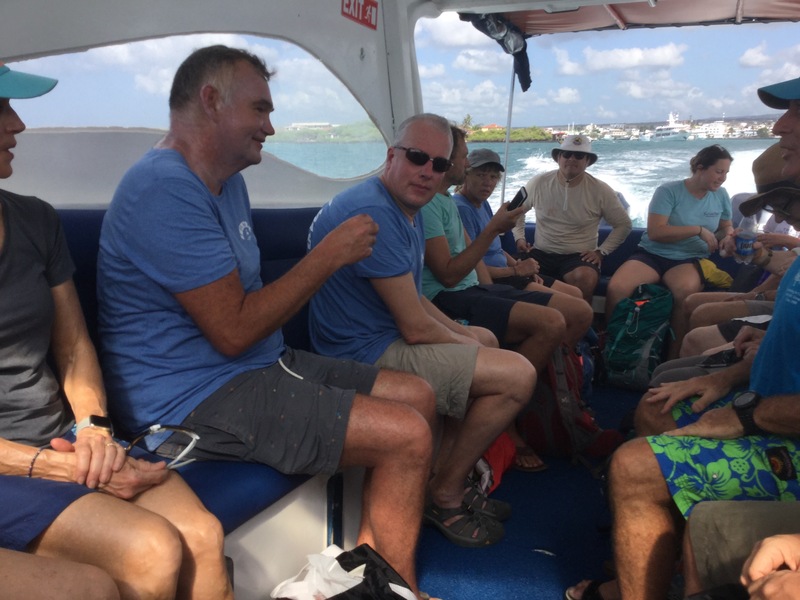 Loved this blog Frances Seemed such a happy time full of wonderful memories.Thank you for sharing your swimming experiences,lovely photos and wonderful descriptions of The Galapagos!